If you’re a Canon body owner, you might think that getting some good spare batteries for cheap would be a great idea! That would mean hours upon hours of shooting, right? Well, those hours could be substantially cut down and could cause some other frustration. The horrible keyword is “cheap.” Ya dig? I love saving money, although I’m horrible at it. Wait, I should rephrase that. I love finding deals. Quite often, you’ll be able to find some third party batteries for popular Canon bodies for a relatively inexpensive price–$15 for a battery! $15?! I could buy 4 of them for the price of one genuine battery! But what you don’t know is that those third party batteries tend to die a lot faster and are quite inconsistent in their build quality. In my scenario, it caused my camera to malfunction–I don’t remember what code was displayed, but it my camera wouldn’t function unless I had a different battery in it. In the worst case scenario, it can literally explode. But, in the best case scenario, the battery works for a decent amount of time, giving you a good $15 worth of battery life, but that’s your gamble. So that’s an $15 battery. What about if you can find a $15 or even $9 Genuine Canon battery? That would be amazeballs right?! Or how about a Genuine Canon Charger for $23? Well, I tend to think that if it’s too good to be true, there might be a slightly small but very much achievable chance of it being true, but probably most likely isn’t. Yeah, I learned that from the trusty old internet. But for real, if it seems too good to be true, it probably is. These typically end up being counterfeit items– those fakes, they’ll get you. Where would I find these “Genuine” batteries and chargers? All over the place. eBay is chock-full of them! Some small independently owned electronic stores may also carry them. Your boss might actually have one or two because your co-worker may have bought one. Unfortunately, they’re increasingly getting better looking. So how do we save the world and your photographer friends? By knowing how to spot a fake one charger and one battery at a time. They’re good looking, but not that good looking. This sounds bad, but most, if not all of them are from China! That’s right, we’re all sorts of crafty and ninja-like over there. Look for is the moving hologram on the packaging of the box. If it doesn’t have it, don’t buy it. Look for weird imprinting. If it’s weird, don’t buy it. Many times the kerning isn’t correct or the logo is tilted, jagged or not smooth, or just doesn’t look right. Check the back of the battery and look for cracked and/or faded print. It is quite often to find that the ink isn’t of good quality. Look at the date stamp found on many batteries. Canon uses a specific font that is kind of tall and narrower than what I’ve typically seen. Beware of corded chargers that require a plug. Genuine ones of this style are typically shipped in Europe. Check the screws, most of the chargers have security screws and not just everyday Phillips (+) screws. Look at the molding of the text near the terminals for the charger. They should be clean and not messily raised. Typically, its a (+) and a (-). Also, the shape and weight may also vary. Canon has been plagued with this issue so much that they dedicated a whole section on their website towards educating people like you and me about this! There’s even a fun little game! Head over to Canon’s About Counterfeits page to explore around. 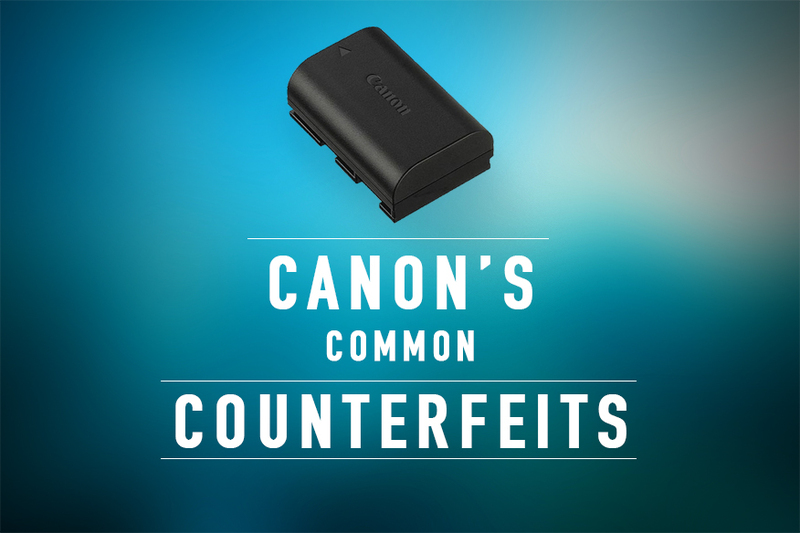 Keep yourself updated and beware that many of Canon’s accessories have fakes– even battery grips! This may sound like a plug, but buy genuine. Maybe find them on sale or something. It’ll save you from a pretty big headache if your batteries turn out to be anything like the ones I bought. *Update, even Nikon has their warnings, they can be found here. While I find your article informative and truthful I do take offence at your comment “we’re all sorts crafty and ninja-like over there”. I am married to a loverly Japanese lady and find your comment offensive. Culturally the Ninja are Japanese, which is nothing to do this Chinese fakes and fail to understand the relevance! First off, let me explain that the ninja have always had a great reputation among us in the US. We know them to be the epitome of stealth, untraceable and very skillful. We think of them to be so skillful that they could do anything to anyone without ever being noticed while playing with the rules of deception. While I don’t claim that the Chinese are or ever were ninja or that the ninja make counterfeit batteries, the manner in which the sneaky and almost unidentifiable counterfeit products that some Chinese manufacturers produced can be–and are in this article–related to the legendary skills that the ninja possess and to the skills that other Asians in the area are known for, thus being “ninja-like”. And yes, I truly believe that we’re resourceful, sneaky, and capable of doing much good and evil due to the skill sets that are associated with Asians. Secondly, to be clear, I do say “we”, as I am Taiwanese (or to purists, Chinese) and am unequivocally quite proud of the skills and acknowledgements that all Asians have been known for, whether it be mystical assassins or skillfully creating items that closely resemble another item. I don’t have any direct ties with Japan or China and do not partake in any politics regarding their relations, but I sure do love Japanese sushi and I sure do love some Chinese shaved ice at the same time. Some may choose to be offended by that relation, but I can’t help if they’re offended by something that isn’t meant to cause offense. I have always had good luck with aftermarket batteries for Nikon supplied by B&H! In fact some of them held a charge longer than the original battery. I do agree that there are some reputable companies that produce some decent batteries! I feel that they’re generally more expensive (maybe by a couple of bucks) than those that I refer to. Some of the third party batteries actually have larger cells than those of which the OEM provides. I’ve had some good times and bad times, but now I’m at a point where I don’t want to fuss with the random issues that may occur. It’s almost like a peace of mind type thing. B&H provides some good quality products for the most part, but they’re also very well established and have a reputation of providing good stuff, and I’m pretty dang sure that they wouldn’t sell you a “Genuine” branded counterfeit at a place of that caliber. Thanks for the comment Arthur! This is true that even OEM manufacturers sometimes have issues with the batteries that they send out. Big name brands do typically have better quality control and use better materials for the most part, but do let a few duds out. The good thing is that they typically have a nice warranty behind defects like that. Another strange example that I have experience with is related to a white Apple MacBook that I had. I had an OEM battery that I used till it was absolutely dead and didn’t hold a charge anymore. I replaced it with a cheap battery from Amazon and it ended up bloating and swelling to the point where it would lift my laptop’s corner off the ground, and rendered the trackpad button useless because of the expansion. Believe me, I hate spending a lot of money on things that I know are pretty cheap to make. If I could make these accessories with the same quality materials for cheaper or find a reputable brand that also cares as much as I do about the product, I’d totally do it– I mean, everyone would do it. In the meantime, I feel that I can trust the OEM batteries a good 98% and maybe third party ones about 70% for the first 2 months.. then like 40% for the rest— but that is according to my tainted outlook caused by dumb batteries that I’ve had in the past. well maybe if Canons batteries weren’t priced like that had platinum electrodes, people wouldn’t have to buy the knockoffs. No offense but I wonder a little about this post since I’ve used knockoffs & “real” Canon batteries for 20 years now and I’ve NEVER had any explode or ruin a camera. In fact, I’ve never had any of my associates have this problem. If they don’t hold a charge quite as long…well that’s why you carry several..like you do anyway. Hey Andy, thanks for your input. I wouldn’t say that people have to buy the knock-offs. I did, but I didn’t have to– I didn’t even know about them either. The point is that people are not even are aware that they buy knockoff Canon batteries, which is the point of this article. I’ve had third-party batteries that were only $10 less than the genuine battery at ~$50, and those turned out fine. The difference, I believe, is that for $15, the quality may or may not be guaranteed. That extra $30-$45 may be worth the piece of mind. I’m not entirely sure about a $15 chance in my $3500 body, but others may feel completely fine. No offense taken, but I do wonder about your use of knockoffs and “real” Canon batteries from 20 years ago though. I’m pretty sure that there was not a real big market for the highly knocked-off rechargeable lithium-ion batteries back then. I’ve also never had any battery actually explode or ruin a camera, although I have had batteries (of all sorts) that have overheated, melted, leaked, had cells burst (which I’d say may or may not cause damage to the camera)–knock on wood, and I hope you never will have one explode or ruin a camera. The main issues that I personally have had are the ones that I previously mentioned–the error code upon start up, and the quick depletion of such batteries. I have had great experience with OEM/Canon batteries and less so with knock off’s. The knockoff’s while being cheaper (maybe for obvious reasons) the lasting power has not been there. Now, just wondering, would you carry around 5 cheaper knock offs or 3 OEM batteries if you could get all of them for the same total price?